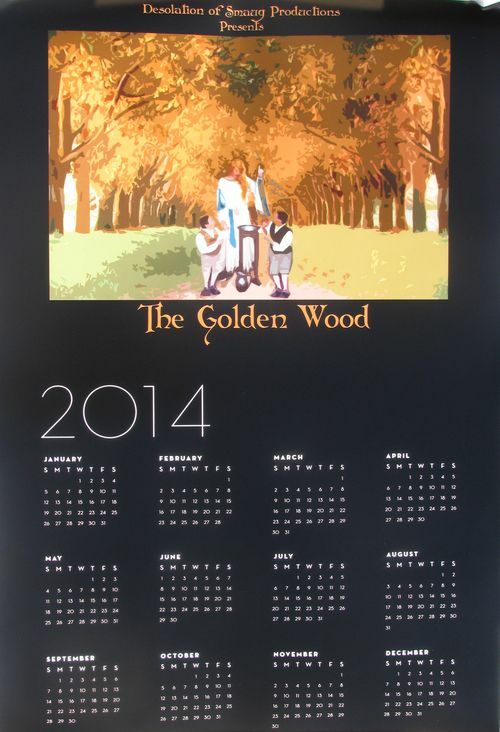 Eleven calendars were catalogued in 2014. If you know of any new calendars not currently listed here, please email me! 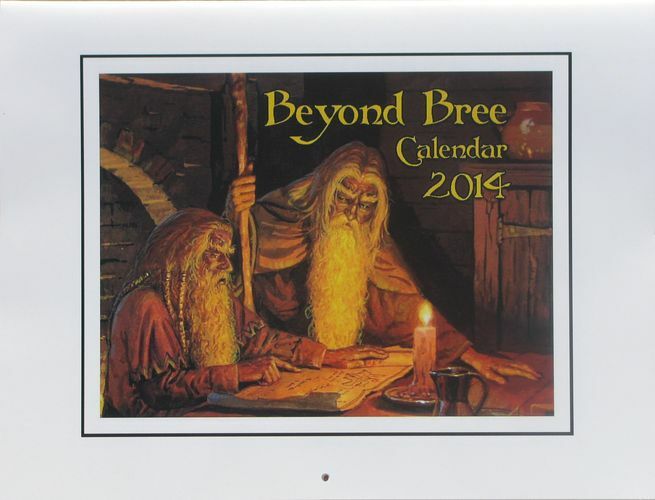 "Beyond Bree 2014 Calendar" Published by Beyond Bree; edited by Dan Smith (who brought us the Middle-earth Fellowship and Desolation of Smaug calendars, and 'Folklore and Legends from Middle-earth' series of tales.) Theme: "Dwarves." Illustrations by Anke Eissmann, Sylvia Hunnewell, Jay Johnstone, Tim Kirk, Octo Kwan, Nancy Martsch, Jef Murray, Ted Nasmith, Colin Williams, Maciej Wygnanski, Gordon J. Palmer, Monika Palys, David Wenzel. Dimensions: 11 x 8 1/2 inches (w x h); punched hanging hole; saddle stapled. Rarity: 7 101 were created. 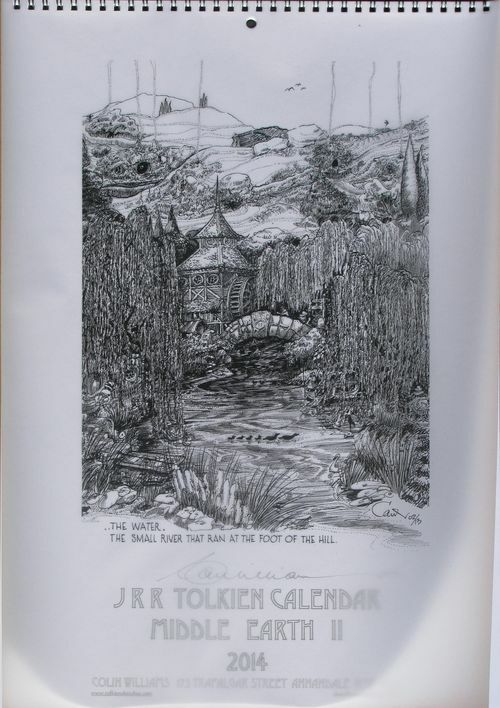 "J R R TOLKIEN CALENDAR MIDDLE-EARTH II 2014" Illustrated by Colin Williams. Clear plastic cover over a white title page. Illustrations from "The Hobbit". Dimensions: A4 (8 3/8 x 11 5/8 inches) (w x h); black wire bound. 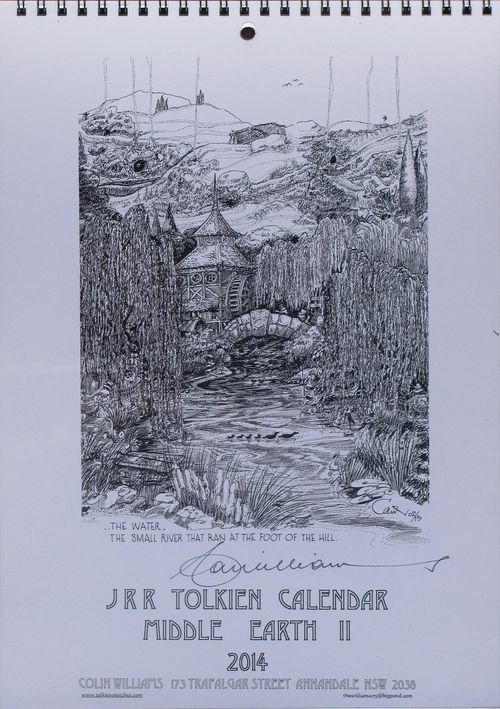 "J R R TOLKIEN CALENDAR MIDDLE-EARTH II 2014" Illustrated by Colin Williams. 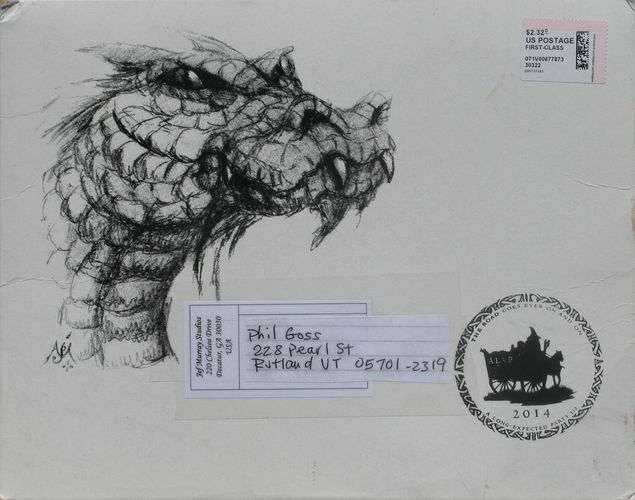 Illustrations from "The Hobbit". Cover illustration on tracing paper over a white sheet with the calendar title. Dimensions: A3 (11.75 x 16.5 inches) (w x h); black wire bound. 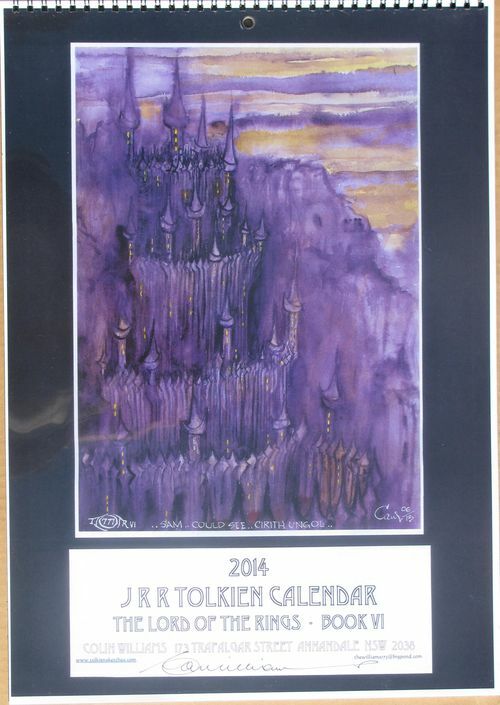 "2014 J R R TOLKIEN CALENDAR THE LORD OF THE RINGS - BOOK VI" Illustrated by Colin Williams. Illustrations from "The Lord of the Rings". Sixth essay into both LotR and full-color watercolor illustrations. Dimensions: A4 (8 3/8 x 11 5/8 inches (w x h); clear plastic sheet over cover; black wire bound. 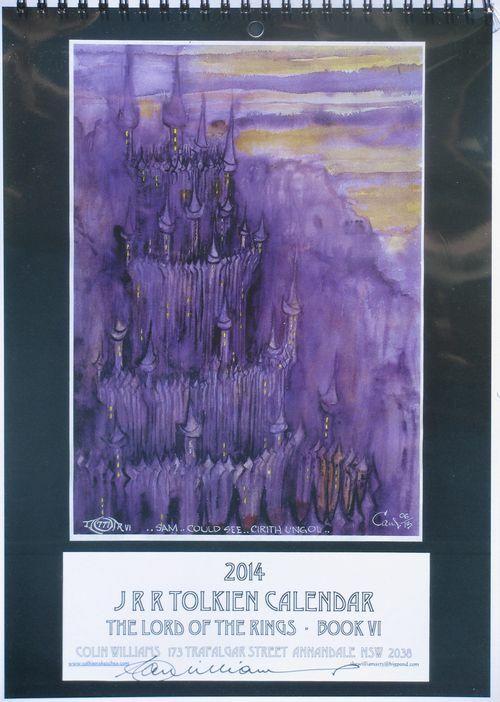 "2014 J R R TOLKIEN CALENDAR THE LORD OF THE RINGS - BOOK VI" Illustrated by Colin Williams. Illustrations from "The Lord of the Rings". Sixth essay into both LotR and full-color watercolor illustrations. Dimensions: A3 (11.75 x 16.5 inches) (w x h); clear plastic sheet over cover; black wire bound. 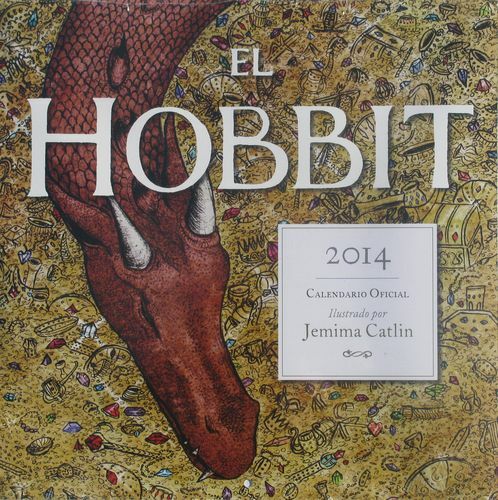 VARIANT: "EL HOBBIT 2014 Calendario Oficial Ilustrado por Jemima Caitlin" Illustrations by Jemima Caitlin. Dimensions: 12 x 12 inches (w x h); stapled; punched hanging hole; corrugated cardboard insert; shrinkwrapped.
" 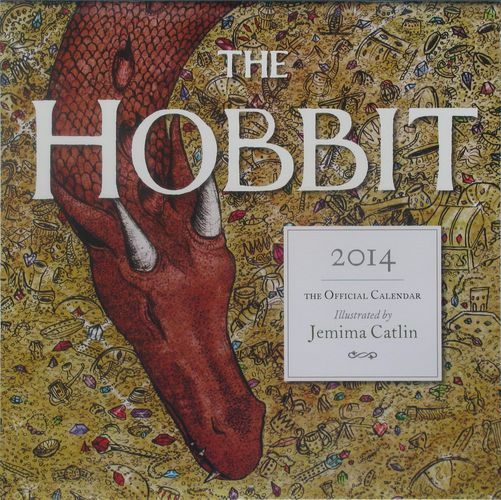 THE HOBBIT 2014 The Official Calendar Illustrated by Jemima Catlin" Illustrations by Jemima Catlin. Dimensions: 12 x 12 inches (w x h); stapled; punched hanging hole; shrinkwrapped. 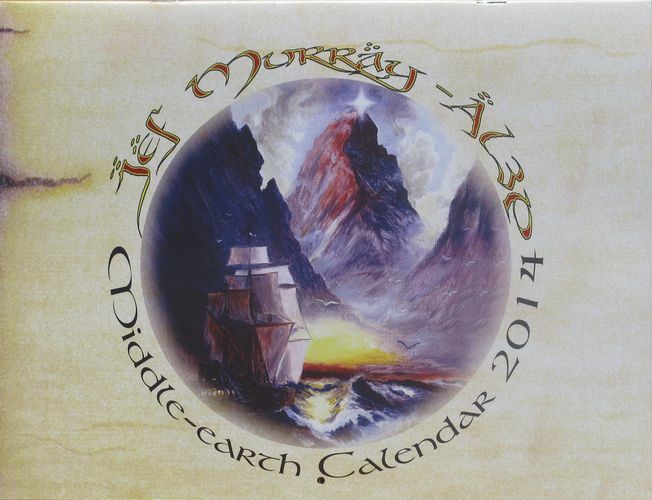 "Jef Murray AL3P Middle-earth Calendar 2014." Illustrated by Jef Murray. Available on his website. Dimension: 11 x 8 1/2 inches (w x h); punched hanging hole; printed white board mailer. 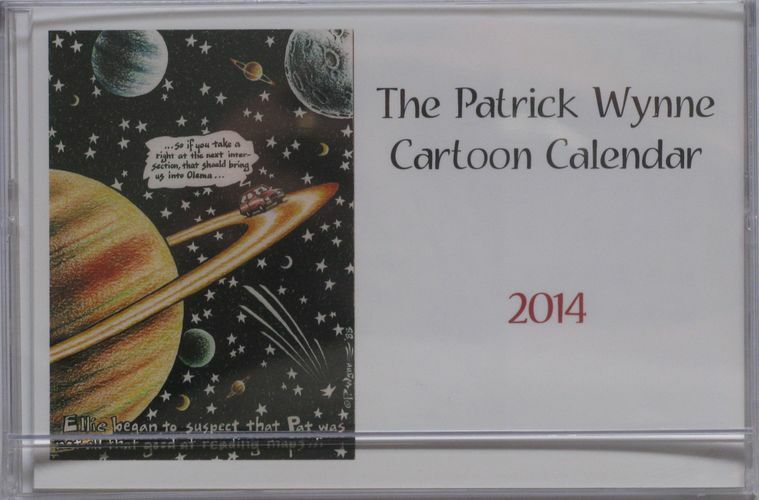 "The Patrick Wynne Cartoon Calendar 2014." Patrick Wynne cartoons from the 80s. Four have JRRT themes. Available here!. Dimension: 6 1/4 x 4 1/4 inches (w x h) jewel case; cartoons printed on 6 x 4 inches photo paper. 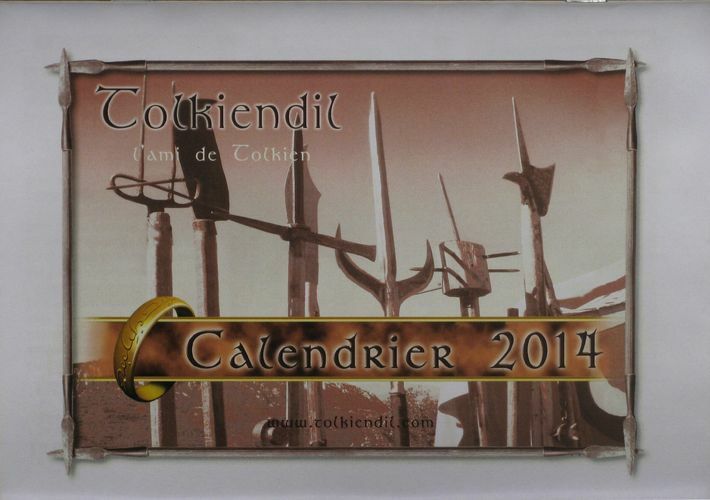 “Tolkiendil l'ami de Tolkien Calendrier 2014" Issued by Tolkiendil, a French Tolkien society. Dimensions: ISO A4: 8.25 x 5.75 inches (w x h).